This is an abecedarian poem. In most cases these start with the subsequent letter of the alphabet beginning each new sequential line. The challenge I set myself was to do a poem like this but with only 26 words. I mainly hang out on a Discord server called The Writers’ Block. Sometimes I write limericks for my friends there. I thought I’d share a few. and soft, every time she saw Wesley. @diebitch (sometimes known as Charu) was moaning about how much poetry she was writing at the sake of her prose. as her poetry just grew and grew. @gmuxx told us how much he hated memes. So I wrote this for his birthday. that brought in the steem and the bucks. @bex-dk is Editor in Chief at the Block. who liked to take texts by their necks. with a red pen that hanged the suspects. We had a user come in who @sufknasen caught plagiarising. who kicked a meltboy to the turf. and was banned in a torrent of mirth. @jwswab used to help edit poetry on the block when I first joined. Where you gone, JR? who took up an editing job. and gave him a punch in the gob. @jayna was talking about fitness regimes one night. who hired a physical trainer. and canceled the scumbag’s retainer. We’ve been writing a lot of limericks lately in the Poetry Academy at the Block. Last night @nobyeni said she was never writing a limerick again. for a whole week wrote limericks aplenty. and on the very next day she wrote twenty. Wit depends entirely on the order of the words. By nature we say the most important thing, the most urgent thing first and then we say all the qualifying phrases. And this never works. It never becomes a memorable phrase. First of all I hope we’re all agreed that wit is not a way of getting your own back on people with minds less nimble than your own. It is any comment on the human condition made in a way that is memorable. If you can refrain from saying the most important thing first then you will find that you’re able to give what you say this particular pattern, which I take to be wit. I open this session with that quote because it really brings us to one of the most important considerations in the editing of poetry. In last session’s Q&A, we talked about defining what is poetry. I just want to return to what I believe is the only simple definition. The simplest definition of poetry I’ve ever heard lies in the distinction between prose and poetry. It is one of form: prose is based on the paragraph whilst poetry is based on the line. If we look at that Gaiety Girl example we see that the most important part of the sentence is not only held back from the beginning but it is the thing left till the very last. There’s a great deal of truth to this idea and you’ll spot it clearly when looking at a good poem, working in two very clear ways. Not only that the concluding lines of the poem should be where the wit is revealed, but also that the final word in each line should punctuate the poem with its thematic imagery. This is essential because, in poetry, the weight of each line is with its final word. Our attention naturally falls there, which is why it’s the most common place to position rhymes. You cannot hope to achieve the spectacular effects poetry can deliver to the page if you don’t get this right. The right word at the end of a line will pound in comparison to the rest and steadily amplify your verse towards a crescendo. Place small and/or insignificant words at end of the lines and it will merely whimper to a close. as Jamey slams the door behind me. the biting teeth and scratching claws. What I want us to note is how this makes us feel when we read. It’s a dramatic event to be sure but it’s not making good use of the end words and so doesn’t take full advantage of the power which poetry can give it. Each line, apart from the last one, seems like it fizzles. In, me, go – all very weak, mundane words which don’t match up to the feel or theme of the poem. Avoid – much better, but still not great. It’s too smooth and without texture. Either by rewriting or with clever use of enjambments (the continuation of a sentence without a pause beyond the end of a line). So let’s edit this to make as much use of the end words as possible. How does it make us feel when we read it now? Each line now ends with a more powerful word and, more than that, punctuates theme into the verse itself. Scrambling, slams, behind, run, measures, biting, claws – these words give us a little prod as we read them like the spike at the end of a spear. I can’t stress strongly enough how important this is when it comes to the editing process. 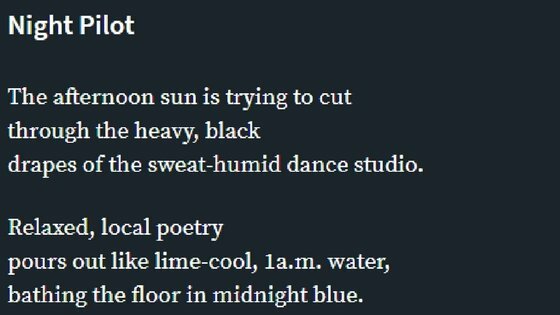 It really is one of the most essential elements in poetic form and is worth spending time on to get exactly right for every poem. This brings us to another big consideration we have to make and that is with line lengths. How long or short should they be for any particular poem? It really depends on the feel you want to give. Poems with long lines give the reader the feeling of distance, of a panoramic film shot, as though they’re taking in everything at once. Poems with short lines give the feeling of intimacy, of a close-up film shot, and make our eye move between multiple images at speed. I wrote some poems this week. Let’s have a look at them. Armageddon is a poem about the horror of nuclear war. In its construction there were really a few ways I could have gone with the specific line length choice. I felt short lines would have been one possible decision, but only if I wanted to show the effects of the disaster on one person. Medium length lines would also have worked somewhat, but, again, I wanted this poem to have grand feel. In the end, the panoramic view of the terror that long lines would give me made me settle on that choice. lean-to shelters made from living room doors. For me, it just seems too much to take in when presented this way. It’s so intense with its rapid frequency of end-words, it makes me want to stop reading and actually doesn’t deliver as much horror as the long lines. This ability to deliver our images in widescreen is where long line poetry gets its power. If you feel like what you’re writing is something you want your readers to take in all at once then you should consider using this technique. Conkers is a confessional poem about first love and first lust. I didn’t need to give much consideration to the line lengths here at all – I knew I wanted to bring the reader is as close as possible and so I went for short lines from the start. And looking at this we can see exactly how short lines derive their power. It is with the frequency of end-words which pull us in close as they hook us with their spikes. This is how to bring the reader in close and make them feel they’re right there with the persona. 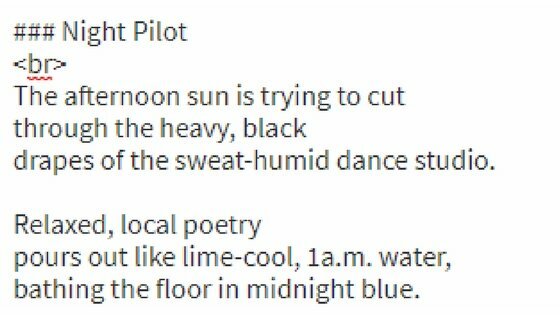 As you first encounter these ideas, you may feel that these considerations are really only applicable to free verse and that poems written in form dictate the line lengths you must use. This is true, but it only means that you should carefully consider the form you use when writing a poem in form or strict meter, because line lengths have exactly the same effect in form poems as well. Take a look at these three examples and see how you get closer up with each successional poem. In the next session we’re going to be talking about one of the final processes in our editing to maximise the power of our poems – conservation of language. as he stares at his mother, screaming to the sky for salvation. Pedestrians panic into a frenzy of self preservation. They push and pull and pummel their way to assumed safety. Or they stand still, looking for help or hope or comforting words. That’s when the brilliant light comes. The city becomes a space of screams and burnt out retinas. the face of this magnificent city into a charred ruins. No one survives within five miles of Piccadilly – ground zero. high above the ground in a gyre of wind and heat that will not sustain. The hopeless souls await the fallout. that this had to be a secret. of fountain and of garden. of monks or broken minds. with weeds and dead grass. Twyford Abbey – three stops away. and pretend it’s a bank holiday. sunbathe under the light bulb.